Good morning everyone! 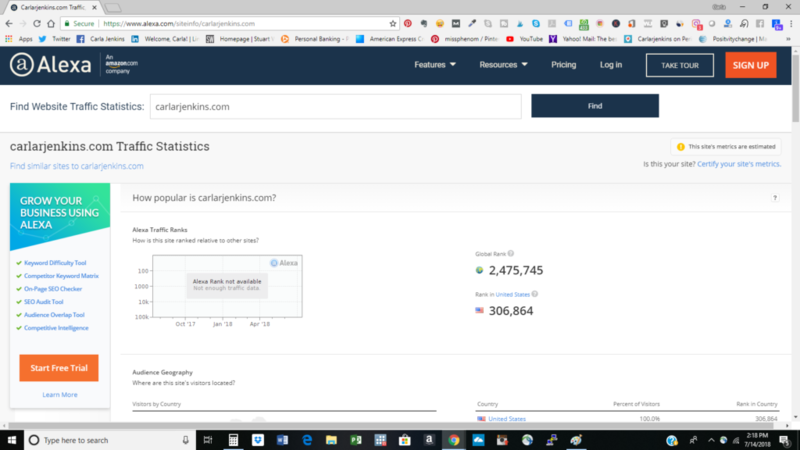 I am in high spirits because www.carlarjenkins.com is NOT ONLY globally and nationally ranked but also has moved UP the Alexa.com ratings all in one week! I am thankful towards being a resource for all of my readers. I love my readers and am happy that they resonate with my material. I have always promised myself never to write fluff always write the real. High-quality actionable content – I am solving people and listening to my audience. My niches are social media, personal branding and project management. Increasing my video output – people consume my content differently. Not everyone reads some watch videos while others listen to podcasts. Engagement – I respond to comments and emails. I am grateful that people are contacting me and asking to for help. I appreciate them. Thanks for having me. I greatly appreciate the Blogger’s Pit Stop community.